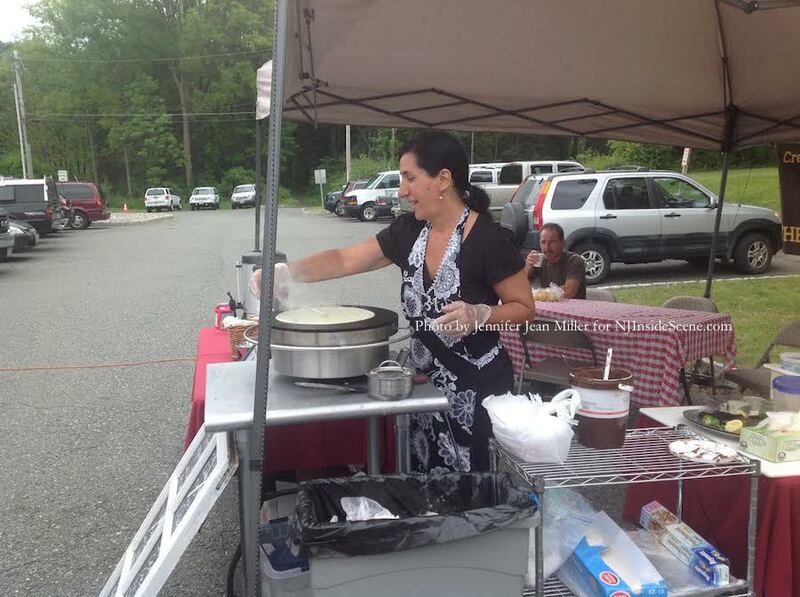 The Sparta Farmers Market offers a variety of vendors, cooking demonstrations, live musical entertainment and more. Photo by Jennifer Jean Miller. SPARTA, NJ – Last weekend, I ventured out to the Sussex County Farmers Market, and wrote about the benefits about buying local from our area farmers markets (click here for that previous article). 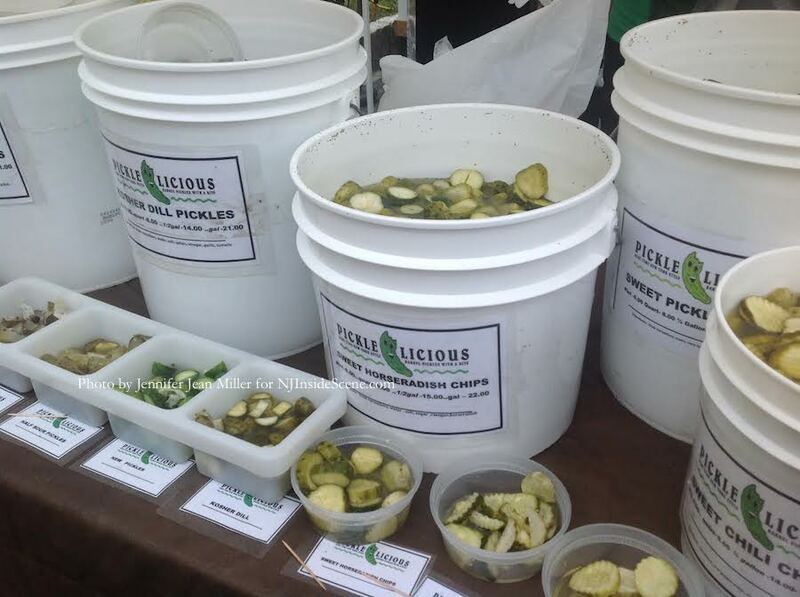 The Sparta Farmers Market takes place each Saturday from May through October. Photo by Jennifer Jean Miller. 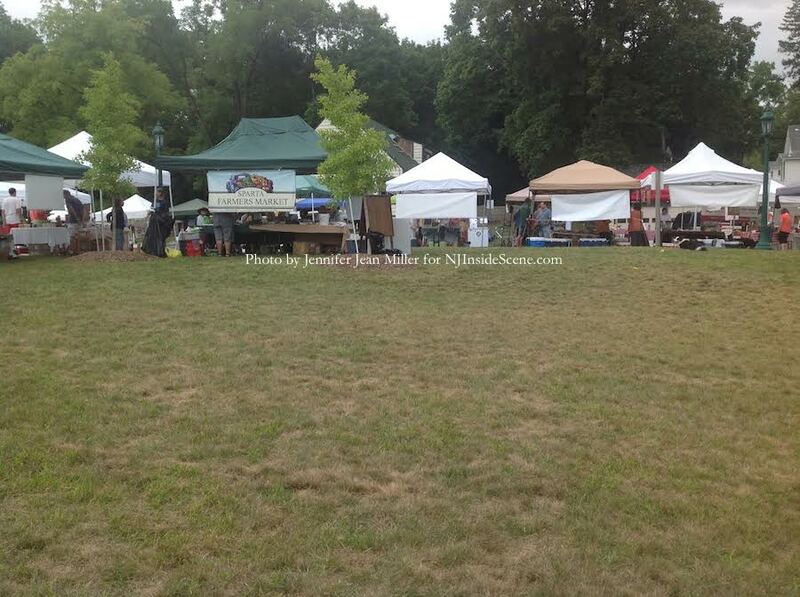 This past Saturday August 23, I visited the Sparta Farmers’ Market. There were many vendors and attendees, in between the raindrops and cloudy skies, though neither weather condition dimmed neither the attendance nor the spirit of the event. The market, which was founded in 2011 by residents Mitch Morrison and Ben Del Coro, along with Korey Lee managing it, has become a popular weekly destination, running through October. It is open each Saturday starting at the end of May, from the hours of 9 a.m. to 1 p.m., at the Sparta Municipal Building. On Saturday October 25, the market, which is sponsored by Lakeland Bank, Laddey Clark & Ryan LLP, and Newton Medical Center, will host its 4th Annual Harvest Festival. Every second Saturday of each month, the farmers market hosts its Saturday Fair. Saturday Fair features local artisans and crafters to be a part of the market. Those artisans include: Edye’s Naturals, Forage Workshop, All Things Good, Saltopia, Touchstone Crystal, and Reed Pottery. Additionally, Saturday Fair boasts a themed festival. Next month’s is a Tomato Festival for the September 13 Saturday Fair. Vendors may vary weekly, but on the average, there are approximately 25 local farmers and artisans in attendance on most days. 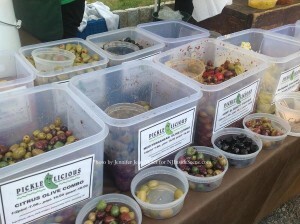 Farmers and artisans from throughout New Jersey and across the borders of New York State and Pennsylvania who attend on a regular basis include: Glenmalure Farm (Branchville), Churutabis Farm, Mosefund Farm (Branchville), Lakeside Maple (Byram), Mo Green Juice (Hawthorne), Pickle Licious (Teaneck), Farmhouse Kitchen (Sparta) Jersey Barn Fire Hot Sauce (Sparta), Kittatinny Mountain Farm (Wantage), Ideal Farm (Lafayette), As Fresh As It Gets Gardens (Wantage), Highland Valley Apiary (Milford, PA), Sunrise Mountain Soaps (Wantage), Gourmet Nuts & Dried Fruit (East Hanover), Windy Brow Orchards (Newton), The Everlasting Garden (Branchville), Apple Ridge Farm (Saylorsburg, PA), Sparta Mountain Farm (Sparta), Hummus Boss (Lake Hopatcong), Crepes By Lena (Sparta), Sweet Things & Wild Thyme Honey (Warwick, NY), Tate’s Cakes & Gourmet Bakes (Newton), Ventimiglia Vineyards (Wantage), Simply Planted (West Milford), Roaming Acres Farm (Lafayette), Rimi Pottery Studios (Washington), Maria’s Gourmet Edibles (Lafayette), Silver Birch Kitchens (Long Valley) and Paolo’s Kitchen (New Providence). 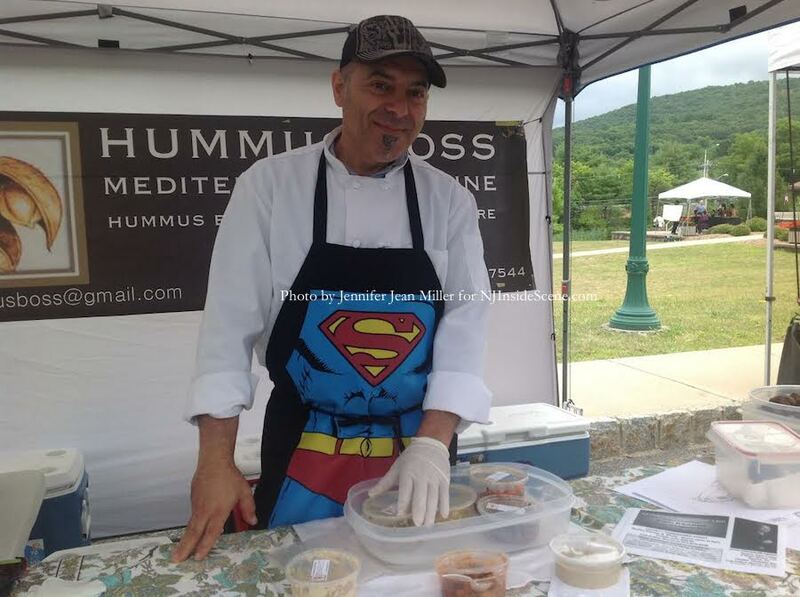 James Matar, the Hummus Boss, with his many culinary creations. Photo by Jennifer Jean Miller. 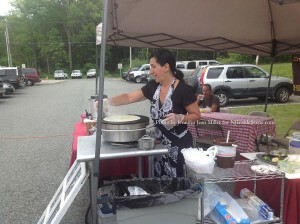 Lena Shugart of Crepes by Lena, creates a fresh crepe filled with Nutella. Photo by Jennifer Jean Miller. Olives and other delectables for sampling from Pickle Licious. Photo by Jennifer Jean Miller. From Chili to Kosher Dill, there were pickle varieties for all. Photo by Jennifer Jean Miller. There were some other vendors who were also there on Saturday, such as Eddy Miller who owns EaZy Bubbles, a local business from Vernon, which specializes in immense bubble nets, and special bubble solutions, for gigantic and lasting bubbles. While the market took place, children and adults alike enjoyed dancing through, photographing, and watching Miller’s bubble display. 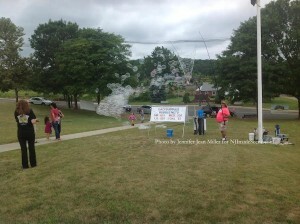 Some of the bubbles took off beyond the municipal building, and headed high above the town. 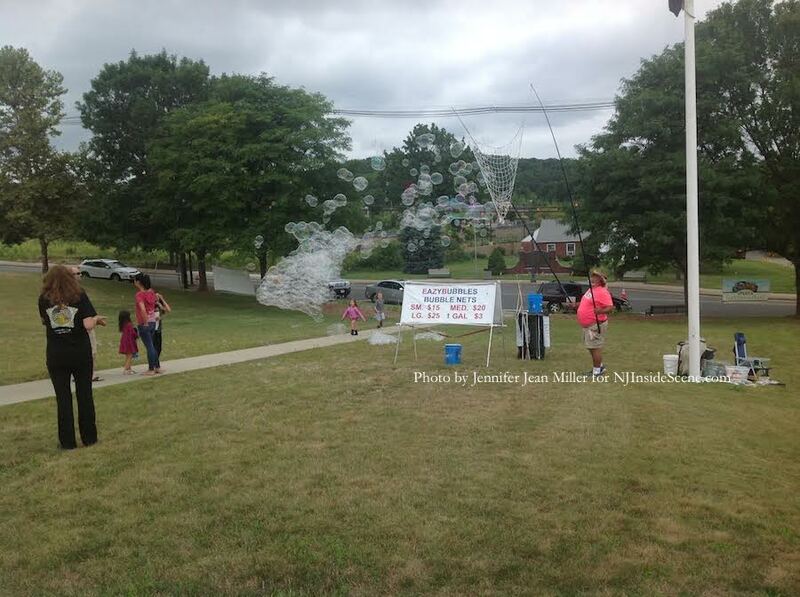 A cloud cover of EaZy Bubbles fills the sky above the front lawn of the Sparta Municipal Building. Photo by Jennifer Jean Miller. 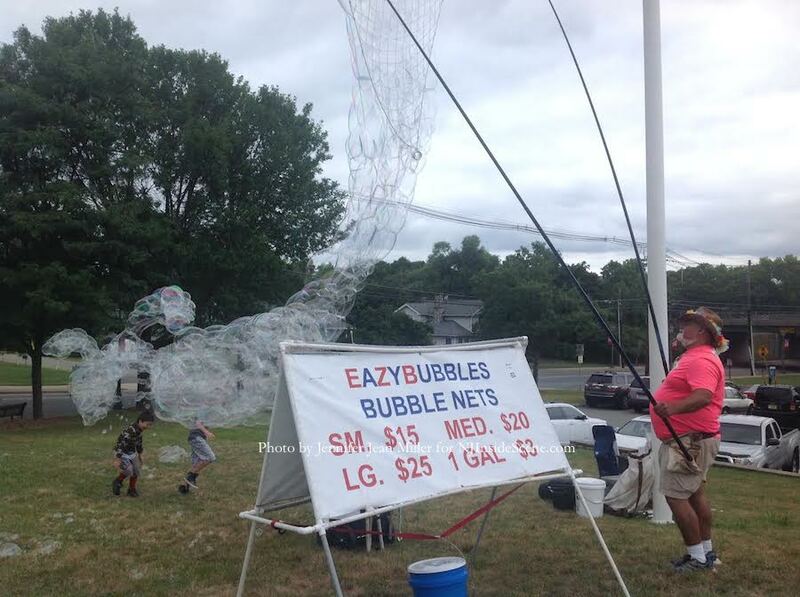 Kids dance playfully through EaZy Bubbles. Photo by Jennifer Jean Miller. Edye’s Naturals was another vendor not on the market’s usual roster, which specializes in Edye’s Body Butter, an organic skin care product, loaded with shea butter, olive oil, avocado oil, New Jersey Bees Wax and other healing ingredients. Some of the items that I picked up while I was there included: the Hummus Boss (who I’d written about in my last article) grilled vegetable bruschetta, which Hummus Boss James Matar had created with vegetables from Ideal Farms, corn from Ideal Farms, and “New Pickles” from Pickle Licious (for those not familiar with the “New Pickle” variety, some refer to this type as half sour, and they tend to be bright green and crisp). Chef George Mandakis of Big Bang Kitchens hosted the weekly cooking demo about clean canning and pickling techniques. 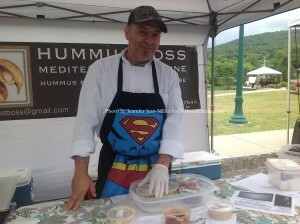 George Mandakas of Big Bang Kitchens during the cooking demonstration. Photo by Jennifer Jean Miller. Jeff Gaynor was this past week’s musical entertainment. 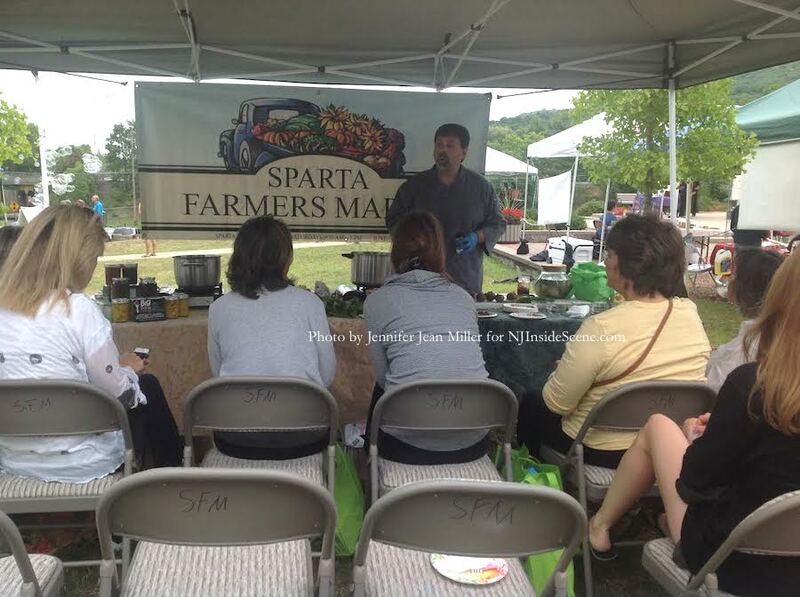 Click here for the Sparta Farmers’ Market Facebook Page, where past market weekends are highlighted with many photos of the market on each particular day, and information is provided about upcoming weekend events. 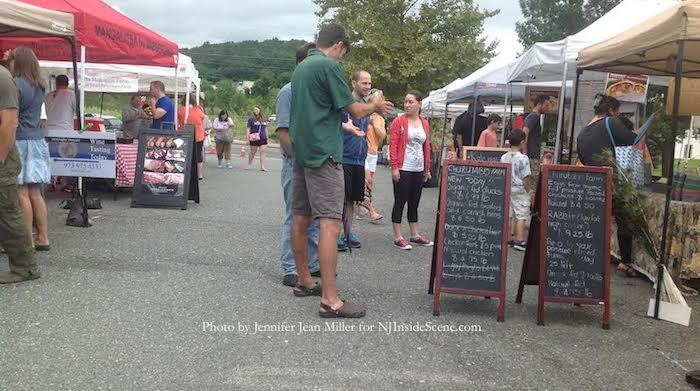 Stay on the scene with NJInsideScene.com and click here to follow us on Facebook for more information about events such as our area farmers markets.